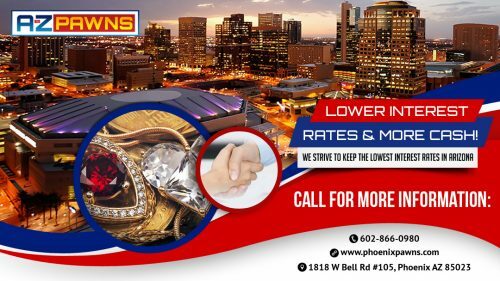 The Phoenix-based pawn shop located on the corner of Bell Road and 19th has an inventory of top quality jewelry at affordable prices. The firm buys and sells items, as well as providing cash pawns. Phoenix AZ - June 4, 2018 / / — A to Z Pawns and Mike Stevens are pleased to announce that they are set apart by their commitment to customers, as exemplified by the various types of services which are available. The firm buys, sells, trades, pawns goods and pays cash to customers who are in need of short-term cash pawns quickly. A step-by-step process is implemented in order to ensure that all customers receive fast and efficient services. The company has an experienced record that goes by more than a quarter-century.